You would think, having shared a “must make” list back in January, that by the time July rolled around I would have every made that I wanted to take on our trip. So then why did I find myself sitting up until midnight every night, the week before our trip? Because I am a gold-medal level procrastinator, that’s why. What I was aiming for, was a set of co-ordinating bags, but still identifiable at a glance. The obvious pattern choice was the Melly & Me Sleepover bag – I had made one previously, so I wasn’t flying blind; I already owned the pattern so that would save me a few dollars; and we knew what we were getting and knew how the bag would work for us, space wise. I decided very early on I wanted to make the body out of heavy-weight denim – these bags were going to be going in and out and in and out and thrown around and covered in red dirt, so I needed something very hard wearing. My plan for the tops of the bags was to use the same fabric in different colour ways – one colour per person to make it easy to spot who’s bag was who, but the same fabric would satisfy my not-quite-rational need for everything to match. It was this detail that held up the planning (partly), trying to find a pattern that I liked that offered a wide enough range in general, and the colours I wanted in particular. For instance, it was without question that Bear would be green, Boy2 orange and Butterfly pink, though even within those parameters I was more fussy than camping bags probably warranted. I then needed another three colours for myself, Mr Barefoot and Beetle, which were less specific, beyond “something I like”. I finally ended up deciding on Mini Pearl Bracelets, and soon I had a lovely little rainbow sitting on my desk. And sitting. And sitting. With a month to go I finally thought I better get started, and went to buy my denim, batting and lining. After all my careful consideration, I ended up with two different coloured denims, after I emptied not one bolt but two! Thankfully the first bolt was enough or two bags, and the second covered the other four. The twitching settled when I realised I could just do the mister’s bag and mine in one colour denim and the children’s in the other. Phew. Then it was time to get going! To try and make it faster and easier for myself, I commandeered our big 12 seater dining table and set up a production line. A lot of the shortcuts I took worked, a couple didn’t. So I wanted to share with you my tips on sewing multiple items on a deadline. DO: cut in bulk. I cut all my denim in one go. And being wider fabric, this meant I could think a bit about how the pieces fitted across my fabric, and found some efficiencies in careful cutting, leaving me with extra fabric for other projects. Similiarly, I cut my lining in one go, and could cut double layers, saving more time. The final run through was cutting the patterned fabric and also the batting. DON’T: assume doing all the stages on each bag in one hit is the best option. I started doing it this way, but found in my case it felt quicker to concentrate on one bag at a time . I do emphasize felt, because I know it probably psychological more than another, skewed by the joy of seeing a finished product churned out on a regular basis. Obviously everyone is different, so experiment and be willing to change. DO: think about what parts of the pattern are purely decorative and could be removed without comprising the pattern or requiring time to adjust. In the case of this bag, I chose to leave off the side triangles, and thus saving time in trimming corners and making binding and fiddling it into the gap and looping it through a ring. I simply sewed a seam right sides together, rather than wrong side, trimmed the excess and boom, same internal bag shape, and 78* steps skipped (*this may** be hyperbole) (**by may I mean definitely). I also found another minor time saving in the handle construction, by not doubling them over and top stitching. The “single” layer handle (being two layers of denim and two of batting) worked perfectly fine without this final step. DON’T: skimp on structural elements. With Beetle’s bag in progress, “someone” questioned why I was quilting it, when I was in a hurry and rapidly running out of time. In my bag-induced stupor, I figured he had a point, though I did warn him it was his bag I would experiment on. Spoiler alert: leaving out the batting was a bad idea, the bag ended up far too floppy and just yucky feeling. I didn’t change it though. DO: be willing to let go of imperfections. I hated the quilting on Bear’s bag that I thought would be cute but just looked a mess when it was finished up into a bag. Mr Barefoot ‘s bag was an unquilted blob. I forgot the outer pockets on mine. I took a breath, pushed them aside and moved onto the next bag. 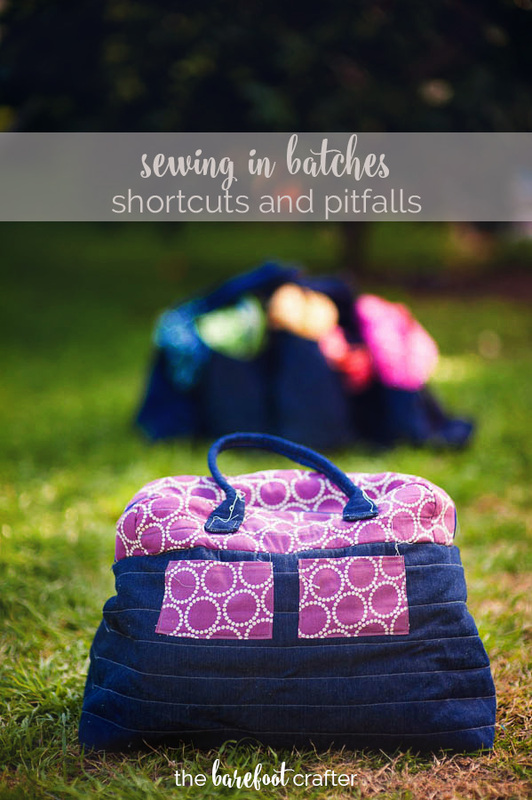 I’d love to hear your thoughts on batch sewing – what shortcuts have you developed that I haven’t thought of yet?